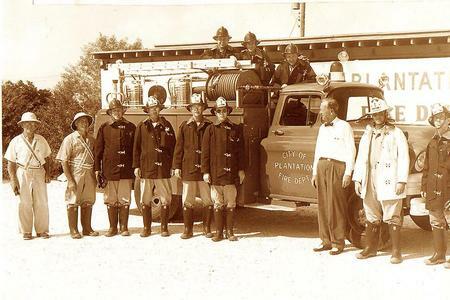 In 1957 a group of 17 civic minded citizens conceived a volunteer fire department to serve the newly born community of Plantation. Since that time, Volunteer firefighters have been in service to the City of Plantation. Today the Plantation Fire Department is the largest volunteer fire department in Florida. It is a multi-faceted community service agency providing a variety of services including fire suppression, emergency medical services, fire prevention, public education, and emergency management. Welcome to the official website of the Plantation Volunteer Fire Association. The PVFA is comprised of some of the finest people I know and supports the largest volunteer fire department in Florida. We celebrate a long and storied history of service to the residents of Plantation and represent the true spirit of neighbor helping neighbor. Feel free to scan through our pages and discover how the Plantation Volunteer Fire Association and its members are so much more than just firefighters. Our members are community leaders who take great pride in making Plantation the great city that it is. Spring is a time of new beginnings. The Plantation Fire Department’s annual training calendar begins with a fun and exciting event. Firematics is a fun and fast paced competition in which members from each station compete in team events where they put their firefighting skills to the test. Afterwards friends and families get together for a cookout, music, and just plain fun. Few holidays are more fun that Halloween and what safer way to celebrate than to get dressed up in your favorite costumes and go trick or treating in a safe, supervised environment. The holidays are family time. The Plantation Volunteer Fire Association is one big family. Each year we bring the Fire Association kids together and celebrate the holiday season with gifts, music, games and a special visit from Santa, who arrives on…of course a fire truck! And today, some of those kids are bringing their kids. The kids have their party and we have ours. To celebrate another year of service, the City of Plantation hosts and annual dinner dance. Members and special guests gather for an evening of great food, great music, and great friends. During the dinner dance we present a video review of the year’s activities and honor outstanding members for their involvement and commitment. The July 4th parade kicks off the City’s annual celebration of Independence Day. Each year the Fire Department, led by our Award winning Honor Guard, displays all its equipment and brings out all our members. After the parade we gather, with our families, for an old fashioned, Independence Day barbecue. ​The very nature of the Fire Service is providing care and comfort to those in trouble. The Plantation Volunteer Fire Association takes it one step further with its Care-A-Little program. Care-A-Little is a charitable program designed to provide at risk children throughout Plantation with help, support, and services they may not be able to obtain themselves. Click on the “Care-A-Little” link above to find out more about what Care-A-Little does and how you can help.